Telecom operator, Tigo Ghana, at the weekend won the ‘CSR Award for Education and ‘CSR Partnership Initiative of the Year at the 7th Ghana CSR Excellence Awards held in Accra. This marks the second straight year that the company has won the education category for its unique approach to improving education in communities. Over the years, Tigo has invested heavily into its educational initiatives such as Shelter for Education, which provides infrastructure and technology support to basic schools in deprived communities in the country. It is also improving the reading culture among children in basic schools through its partnership with ‘Raising Readers Ghana’. For the ‘CSR Partnership Initiative of the Year, the company, known for using mobile technology to transforms lives, was highly praised for its Automated Birth Registration system initiative, a partnership with UNICEF and the Births and Deaths Registry. The system has revolutionized the birth registration process in the over 300 communities where it is currently being piloted – providing ease and convenience for both parents and registration officials. Since May 2016, the system has registered over 328,882 new births. 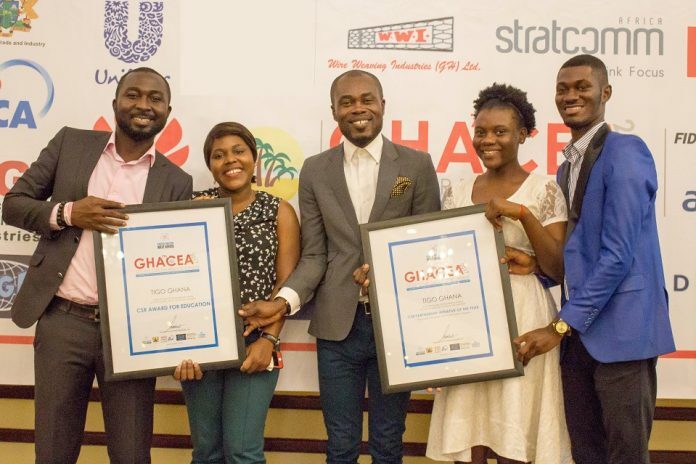 Organised by the Centre for CSR, West Africa, a leading Corporate Social Responsibility and Sustainability strategy development and policy advocacy in the West Africa, the awards, which is in its 7th year received over 100 entries from different industries in Ghana.